The following document includes both the operational procedures for the management of the Cemetery and policies to be followed in the management of the Association. The Association was chartered as a Non-Profit Corporation by the State of Texas in 1952 and renewed in 2002. Policies and procedures are consistent with practices that reflect and support the historical relationships between the Fairview Baptist Church and the Thurmond-Fairview Cemetery Association while maintaining the original purposes established by the founders. Section 1. Name. The name of the organization shall be the Thurmond-Fairview Cemetery Association, Inc. Section 2. Location. Business of the Association shall be conducted in New Fairview, Texas except for meetings of the Board of Directors that may be held at announced and agreed upon sites requiring less travel for members. Official documents shall be stored in a safety deposit box in a bank designated by the Board of Directors. Section 1. Purposes. The purposes for which this Association is formed are to perpetuate the organization, to carry out the program as outlined in the regular Annual Meetings, to beautify the cemetery property, to provide opportunities for burial that meet changing needs, and to guarantee as nearly as possible that successors in office will continue this work indefinitely. A. The Association is created and organized as a non-profit corporation chartered solely for the purpose of maintaining the graves, beautifying cemetery property, and managing the general upkeep of the cemetery. B. The Association’s assets and earnings will be disposed of only in one or more of the following ways. 1). For the ordinary and necessary expenses of operating, maintaining, and improving the cemetery. 2). As payment for acquisition of property for expansion of cemetery grounds. Section 2. Compliance. 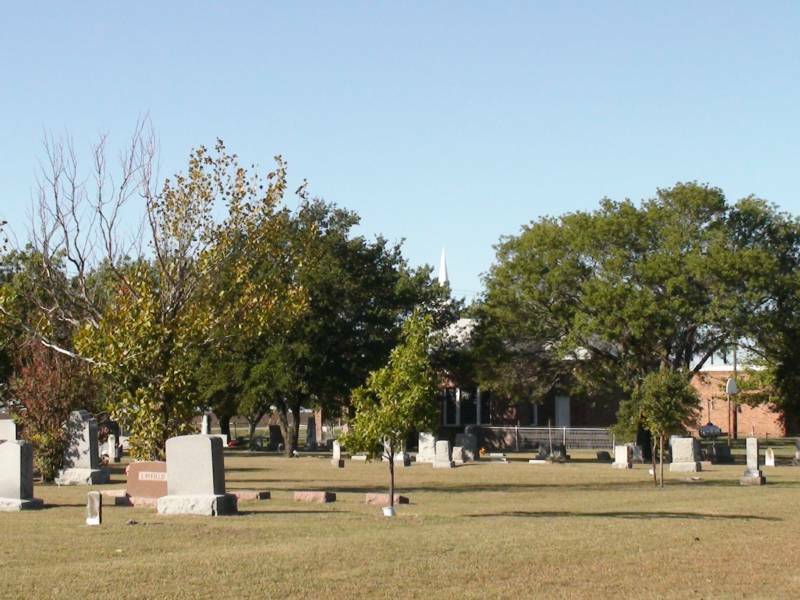 The Thurmond-Fairview Cemetery Association is a corporation duly organized and existing under the laws of the State of Texas. The Association operates under authorization by subdivision number 105 of article 1302 of Texas Revised Civil Statutes of 1945 as amended. The term for which this charter is granted is 50 years and requires application for renewal as a non-profit corporation in the State of Texas. Section 1. Status. Membership in the Association shall be for the life with a one-time payment of the amount determined at the Annual Meeting upon recommendation from the Board of directors. Life membership cannot be transferred to any other individual. Section 2. Qualification. Membership in the Association shall be limited to the lot owner, the spouse, and children or descendents of the lot owner. Written applications from other individuals must include a full explanation of the reason for the request before consideration for an exception by the Thurmond-Fairview Cemetery Association Board of Directors at a meeting. Section 3. Membership status. The Treasurer and Secretary shall maintain a list of members. A. Members for whom mailing addresses are incorrect and whose mail has been returned with markings of unknown or undeliverable for two successive years shall be given Inactive Status. Names of Inactive Members will be removed from the official mailing list. B. Upon receipt of a correct mailing address the name shall be removed from the list of Inactive Members and returned to the official mailing list of Active Members. Section 4. Privileges. Privileges of members are participation in the Annual Meeting, the right to vote at meetings and hold elective office. Each member shall receive notice of the Annual Meeting that will include proposed amendments to the Association Bylaws. Section 5. Application for Membership. The application for membership shall be submitted to the Treasurer or to any Cemetery Association Representative [officer] who will forward it with payment of dues to the Treasurer. Payment of the prescribed dues will allow the individual all privileges specified in Section 3. Section 1. Elected Officers. The elected officers of the Association shall be a President, Vice-President, Secretary, Treasurer, and five (5) Directors. All officers shall perform the duties prescribed by these bylaws and by the parliamentary authority adopted by the Association. No officer shall receive compensation for duties performed on behalf of the Thurmond-Fairview Cemetery Association. Section 2. Terms. Terms for officers shall be two years with the election of President, Vice-President, and two  Directors in even-numbered years. The Secretary, Treasurer, and three  Directors shall be elected in years ending in odd numbers. A. Officers are eligible for re-election. B. The term of office shall begin and/or end at the conclusion of the Annual Meeting. Section 3. Qualifications. Nominees for President shall have served at least one term as a member of theBoard of Directors. Members of the Association who attend and participate in Annual Meetings shall be eligible for nomination and election to all other offices. Section 4. Election of Officers. An election shall be conducted at the Annual Meeting of the Association according to the schedule specified in Section 2. Any member may place a name in nomination provided the nominee meets the qualifications specified in these bylaws and prior consent for the nomination and election have been given. ​A. In the event of resignation, death, or permanent disability of the President, the Vice President shall assume all duties assigned to the President. In the event the Vice-President does not wish or is unable to serve, he or she shall call a meeting of the Board of Directors within thirty  days for the purpose of electing a President to serve until the next Annual Meeting. The Vice President shall perform the duties of the President for the interim until the election of a new President. B. A vacancy in any other office shall be filled by Board of Directors at its next meeting or remain vacant until the next Annual Meeting depending on the regular meeting schedule. Section 6. Duties. Officers shall perform the duties prescribed in these Bylaws and by the parliamentary authority adopted by the Association. ​A. The President shall be the chief administrative officer of the Association and as such shall preside at all meetings of the Association membership and of the Board of Directors. a. He or she shall exercise a general oversight over the business of the Association and enforce its Bylaws and policies. b. The President may assign to an elected officer any additional duties not specified as a responsibility of another officer. c. The President shall make a report to the membership at the Annual Meeting and at all meetings of the Board of Directors. d. The President shall manage the sale of lots and advise/assist all officers in determining that purchasers are eligible under the provisions of these bylaws. e. The President shall be the official representative of the Thurmond-Fairview Cemetery Association in matters involving negotiation of contracts and arrangements with employees. f. He or she shall act on behalf of the Association with authorization by the Board of Directors. ​B. The Vice-President shall serve as a member of the Board of Directors, Assist the President when requested and be the liaison for contacts with the State of Texas on all matters relating to the Association Charter. a. The Vice-President shall perform the duties of the President during the latter’s absence or disability. b. In the event of the death or permanent disability of the President, the Vice President shall assume all duties assigned to the President OR shall call a meeting of the Board of Directors within 30 days for the purpose of electing a President to serve until the next Annual Meeting. c. The Vice President shall perform the duties of the President until the election of a new President. ​​C. The Secretary shall record all votes and minutes of the Annual Meeting of the Association and for meetings of the Board of Directors. a. The secretary shall perform such other duties as pertain to his or her office including signing copies of Association documents, preparing agendas prior to each Annual Meeting and for all meetings of the Board of Directors. b. The secretary shall work with the treasurer to maintain the membership list and to notify members of the Annual Meeting. c. The secretary shall perform additional duties assigned by or specified by the actions of the Board of Directors. D. The Treasurer shall be the chief financial officer of the Association and shall follow procedures detailed in Bylaw Articles VII and VIII. He or she shall maintain oversight of all accounts, the collection of dues, fees, and assessments and shall keep complete and accurate records of all Association funds. a. The treasurer shall present a proposed budget to the Board of Directors for review and recommendation to the membership for approval at an Annual Meeting. b. The Treasurer shall work with the Secretary to maintain the membership list and to notify members of the Annual Meeting. c. The Treasurer and shall make a full financial report to the membership at the Annual Meeting and shall report on the financial condition of the Association at all Board of Directors meetings. d. The Treasurer shall be responsible for the preparation and distribution of documents relating to the purchase of lots. ​E. Directors shall serve with other elected officers as members of the Board of Directors. a. Directors shall serve as official Cemetery Association Representatives for the sale of lots and in the promotion of membership. b. Additional duties not designated for other officers may be assigned to Directors by the Presidents or by action of the Board. Section C. The Secretary shall record all votes and minutes of the Annual Meeting of the Association and for meetings of the Board of Directors. 1. Composition. The Board of Directors shall be comprised of the President, the Vice-President, the Secretary, the Treasurer, and the five  Directors. After the election of a new president, the Past-President shall serve one year as a non-voting member on the Board of Directors. Section 2. Duties. The Board of Directors shall have general supervision of the affairs of the Association and shall have responsibility for enforcing its policies. A. The Board of Directors is empowered to act on behalf of the Association only on matters requiring decisions between the regular scheduled Annual Meetings of the Association. B. Reports of such actions shall be made to the Association membership at the next Annual Meeting. C. The Board of Directors shall develop recommendations for presentation to the membership at the Annual Meeting, approve topics to be listed on the agenda, review the proposed annual budget, and arrange for audits at appropriate times. D. Actions of the Board of Directors shall be subject to the orders of the Association and action shall not conflict with any policy or procedure specified in these Bylaws or approved by the membership at its Annual Meeting. Section 3. Meetings. The Board of Directors shall meet following the Annual Meeting and for at least one additional meeting between Annual Meetings of the Association membership. A. Members of the Board of Directors must agree to the time and place for meetings. B. Notice of the meeting shall be given to officers not less than ten or more than thirty-five days before the meeting is held. C. Seven  members shall constitute a quorum. D. No proxy or absentee votes will be accepted. Section 4. Special or called meetings. Special meetings of the Board may be called by the President and must be called upon the written request of three members of the Board. ​​A. Notice must be given to each member not lNotice must be given to each member not less one week before the Special Meeting is scheduled. B. Seven members shall constitute a quorum. C. No proxy or written votes shall be accepted. Section 1. Annual Meeting. The ultimate authority of the Thurmond-Fairview Cemetery Association is the membership present and voting at the Annual Meeting. Such meeting shall be on the first Sunday in May at the Fairview Baptist Church facilities, 969 FM 407, New Fairview, TX at 12:15 P.M. Section 2. Notice of Meetings. Written notice of the date, time, and place of the meeting shall be sent to each active Association member at least ten but not more than thirty-five days before the date of the meeting. The notice shall include agenda topics approved by the Board of Directors and recommendations for Amendments to the Bylaws of the Association. Section 3. Agenda. The meeting shall follow the agenda included in the parliamentary authority for the Association and include an election of officers corresponding to the order in Article IV, Section 2 of these bylaws and approval of a budget for the year. Specific topics approved by the Board of Directors shall be included in the notice of the meeting sent to each member. Section 4. New business. In addition to recommendations from the Board of Directors, any member may propose an item of New Business during the meeting provided it does not conflict with provisions of the Association Bylaws. Section 5. Voting. Each member present at the Annual Meeting shall be entitled to vote on all matters considered. No written votes or proxy votes will be accepted. Section 1. General policies. Each land purchase shall be designated as Plat 1, 2, 3, etc. and shall be divided into lots of two  or no more than four  grave spaces. A. Copies of all plats are on file in the office of the Wise County Clerk in Decatur. B. The boundaries of Thurmond-Fairview Cemetery Association property are marked with fences and concrete posts. C. Each grave space may be used for one casket or two urns. a. Grave markers are limited to upright or flat stones. E. Funeral homes are responsible for the removal of excess dirt from gravesites. Signs shall be posted on cemetery property to notify funeral homes of the policy. If dirt is not removed, the funeral home will be billed an amount approved by a vote of the membership at an Annual Meeting. F. Walkways and roadways shall be left open at all times. G. Individual owners of lots may not install curbs, fences, trees, or shrubs on or around lots. Requests for exceptions must be made in writing to the Board of Directors for action at a meeting. H. Grass is the only acceptable covering for lots. Section 2. Cemetery Areas. Each land purchase shall be designated as Plat 1, 2, 3, etc. and shall be mapped into lots of two (2) or no more than four (4) grave spaces. A. Original section—Plat 1 and Plat 2. The size of lots is either for two (2) or four (4) grave spaces. B. Plat 3—Numbers of lots shall begin with Section 3, lot 1. Section 3. Sale of lots. Lots for burial purposes only are available for purchase. The President shall manage the sale of lots and determine that purchasers are eligible under the provisions of these bylaws. A. Lots shall remain the property of the purchasers and their heirs forever. B. The treasurer shall prepare a Cemetery Deed and shall forward a notarized copy to the purchaser. C. Individual purchases shall be limited to eight  grave spaces. Exceptions to the rule require a written explanation of reasons for the request and approval by the Board of Directors at a meeting. D. The size of each lot shall be either for no more than two (2) grave spaces or four (4). Each site or space may be used for one casket or for two urns. Section 5. Cemetery upkeep. Owners of lots share responsibilities for upkeep with the President and Board of Directors who provide leadership in the care and maintenance of the property. A. The Association shall engage an employee(s) to provide general maintenance for the Cemetery. General maintenance shall be mowing, trimming, and removal of trash. B. The President shall negotiate terms of employment and specific expectations for the position established by the membership and the Board of Directors. C. Terms of the arrangement and special considerations shall be reported to the Board of Directors. D. Responsibility for oversight of the employee shall rest with the President or a designated member of the Board of Directors. F. The Association shall provide equipment and materials needed to maintain and restore the property due to erosion or damage according to policies outlined in Article VIII, Section 3. Section 1. Fiscal year. The fiscal year shall be from April 1 through March 31. A. Membership Dues. Life membership shall be available to individuals who qualify for membership and pay a one-time fee. The Board of Directors shall recommend changes in the amount of dues as an agenda item for the Annual Meeting. Life membership cannot be transferred to any other individual. B. Lot sales. The Treasurer will execute a Cemetery Deed for each lot purchased [Article VII, Section 3] and shall report the total income from sale of lots in the Financial Report to the Annual Meeting. C. Dirt removal fee. The amount of the Excess Dirt Removal Fee shall be approved by the membership at an Annual Meeting after a recommendation from the Board of Directors. The amount shall be posted on cemetery property and area funeral homes shall be notified when changes are made. D. Interest income. Interest paid to the Association by financial organizations or banks holding CDs, annuities, and other special interest-bearing accounts may be transferred to the operating fund for projects included in the Annual Budget. E. Perpetual care shall be included in purchase price of lots. The Board of Directors shall recommend fees to be assessed for lots purchased prior to 1997. F. Voluntary gift funds. Individuals may contribute financial gifts for designated purposes provided there is no conflict with the purposes or policies of the Association or with the IRS regulations for a Nonprofit Mutual Cemetery organization. G. Mineral royalties. Income from royalties shall be invested in an interest bearing account in a bank or depository selected by the Board of Directors. Section 3. Policies. Fiscal responsibility for the operation of the Association shall rest with the Treasurer as the chief financial officer of the Association with the assistance of the President and Board of Directors. All policies shall be consistent with requirements for a Nonprofit Mutual Cemetery with exemption from Federal income tax under Section 501 (c) (13) of the federal Internal Revenue Code and operating as a non-profit corporation chartered by the State of Texas. A. All funds of the Association shall be deposited in a timely manner to the credit of the Association in such banks or depositories as the Board of Directors may select. B. Either the President or the Treasurer may sign checks for payment of budgeted items provided the amount expended does not exceed what was specified in the budget. C. The Board of Directors must approve expenditures in a Regular or Called Meeting for amounts above $1000.00 for materials or expenses not included in the budget for the current year. D. Three  bids shall be secured for major projects and reviewed by the Board of Directors before contracts are awarded. 1) No benefit to individuals from Association. The Thurmond-Fairview Cemetery Association shall not be conducted for financial gain and no part of its earnings shall inure to the benefit of any private member or individual. 2) Operating fund. Any receipts of this association in excess of the expenses of operating shall be placed in an interest-bearing fund for future operational expenses, or as a reserve for designated repairs and improvements. Interest from such accounts may be dedicated for future operational expense. 3) Prohibition of Use of Funds for Political and Other Purposes. This Association will not spend any money attempting to influence the selection, nomination, election, or appointment of any person to any Federal, state, local public office or to an office in a political organization. Section 1. Fiscal policies. If at any time the Thurmond-Fairview Cemetery Association should be dissolved, no part of its funds shall be distributed to or among its members, contributors, directors, officers or any person for use as their private funds. Section 2. Appointment of receiver. Should the Association dissolve, after the payments of all indebtedness, all the remaining assets said Association shall be transferred to an appropriate authority designated by the Wise County Commisioners Court. A. In the event of dissolution, the after reactivation is proven to their satisfaction the Wise County Commisioners Court is hereby authorized to deliver such funds to the duly elected Directors. B. Reactivation is hereby defined as whenever as many as six people who are or who become members of the Thurmond-Fairview Cemetery Association declare the Association reactivated by subscribing their names to a document stating that the Thurmond-Fairview Cemetery Association is thereby reactivated. A. Concrete markers and fences shall designate the property lines of the Cemetery Association and the Fairview Baptist Church. B. The Fairview Baptist Church is granted use of the Fairview School building according to terms of the 50 year lease agreement signed in July, 1976 in return for the remodeling and upkeep of said building. D. The Thurmond-Fairview Cemetery Association and the Fairview Baptist Church shall share expenses of maintaining the water well on a 50%-50% basis. A. The DOT Survey and Maps reflect the current measurements of property owned by the Thurmond-Fairview Cemetery Association. B. A triangle from original property of the Fairview School was used for the turn at the intersection of FM #407 and #2264 reducing the original acreage donated to the cemetery. Section 3. Co-Serv Electric. In return for placing two poles on cemetery property the company agreed to place a security light on each pole, to maintain the lights, and to provide electricity as long as the poles remain on property of the Thurmond Fairview Cemetery Association. 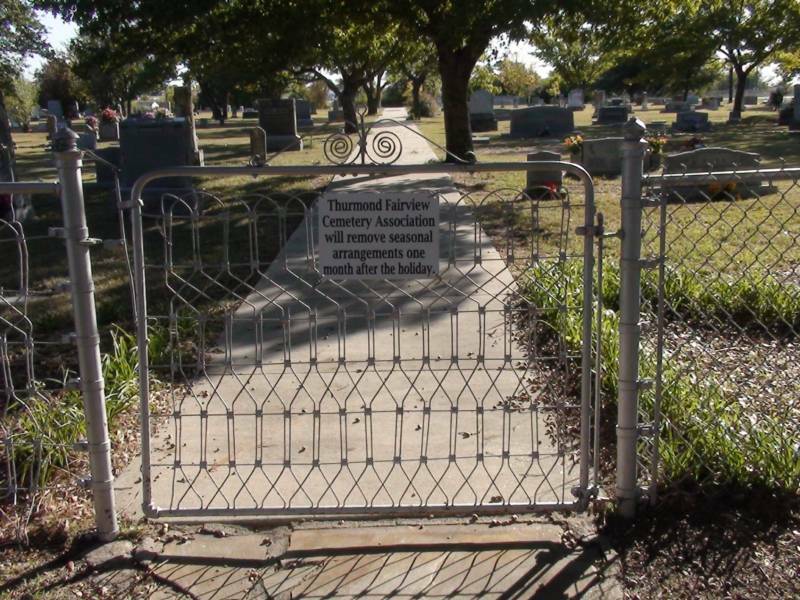 The original copy of The History of the Thurmond-Fairview Cemetery is filed in the Wise County Museum in Decatur, Texas. The President shall appoint representatives to review and update the document periodically. These bylaws may be amended at an Annual Meeting of the Association by a two-thirds vote, provided the Board of Directors has included the item on the agenda for the Annual Meeting and copies of the proposed amendment have been submitted to the membership with the notice of the meeting. The policies and procedures prescribed in these Bylaws of the Thurmond Fairview Cemetery Association were approved by the membership at its Annual Meeting on May 6, 2007 and became effective immediately. Amendment: Article VIII: Section 1.